The power of a stable internet, without lag or buffering is important to support digital life. Well, addressing this condition LINKSYS introduces the Maxstream Family Router line. All of them already have Seamless Roaming features, wireless AC technology and parental control to limit the activities of baby in cyberspace. The products included in the Linksys MAXSTREAM Family are EA7500-AH MAXSTREAM AC1900 + MU-MIMO Gigabit Router, EA8300-AH MAX-STREAM AC2200 MU-MIMO Gigabit Router, EA9300-AH MAXSTREAM AC4000 + MU-MIMO Gigabit Router. EA7500-AH MAX-STREAM Dual-band AC1900 + MU-MIMO Gigabit Routers that have speeds up to 1.9 Gbps and double the performance of a single band. So that it can connect various devices to the network in accessing 4K and HD Video Stream simultaneously so that it can ensure Wi-Fi connectivity without interruption to multiple devices at home and function as if each device has its own router. For MAX-STREAMTM AC2200 Tri-Band Router (EA8300) and MAX-STREAMTM AC4000 MU-MIMO Tri-Band Routers (EA9300) are routers with Technology doubling Wi-Fi performance while maximizing Tri-Band performance. EA8300 speeds reach 2.2 Gbps and are equipped with Quad-Core Central Processing Unit (CPU), while the EA9300 has an additional band of 5GHz to increase speed up to 4.0 Gbps. Parental Control complements the features of the Max-Stream Family Router range. Equipped with the LINKSYS SMART WiFi application that can be downloaded on a mobile phone, it makes it easy for you to manage and monitor internet usage activity at home in your hand. These routers also use MU-MIMO (Multi-User Multiple-Input Multiple-Output) technology for unbroken connections to all devices such as HD streaming media players, 4K TVs, tablets, and game consoles that consume a lot of bandwidth. Thanks to this technology feature, the router can send Wi-Fi to multiple devices at the same time at the same speed. "Seamless Roaming feature presented by Linksys to answer the needs of consumers who want an internet connection that is not interrupted when switching rooms when doing video calls or streaming at home," said Channel Sales & Marketing Manager, Ivona Radita in Jakarta. She added that the workings of Seamless Roaming also make it easier for users to move from one room to another, one floor to another, by always being connected to a Wi-Fi connection at home. Another advantage of Seamless Roaming is the use of a single network name (also known as SSID) that can be used for the entire network, making it easier to always stay connected with the best Wi-Fi signal. To maximize internet connection in a wider range, users can add extender usage. Linksys also provides RE7000 MAX-STREAM AC1900 + Wi-Fi Range Extender for the use of Maxstream Family routers. "The advantages of the RE7000 extender product also have a Spot Finder Technology feature that is felt when setting up an extender. When the Extender is placed at the perfect point, users get optimal connections in various rooms," she added. With the combination of using the Maxstream Family router plus the RE7000 extender, the internet connection will be maximized and stay connected automatically with the strongest Wi-Fi signal when moving to various rooms. 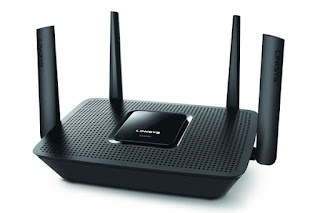 0 Response to "Linksys Maxstream Family, Router Features Seamless Roaming and Parental Control"